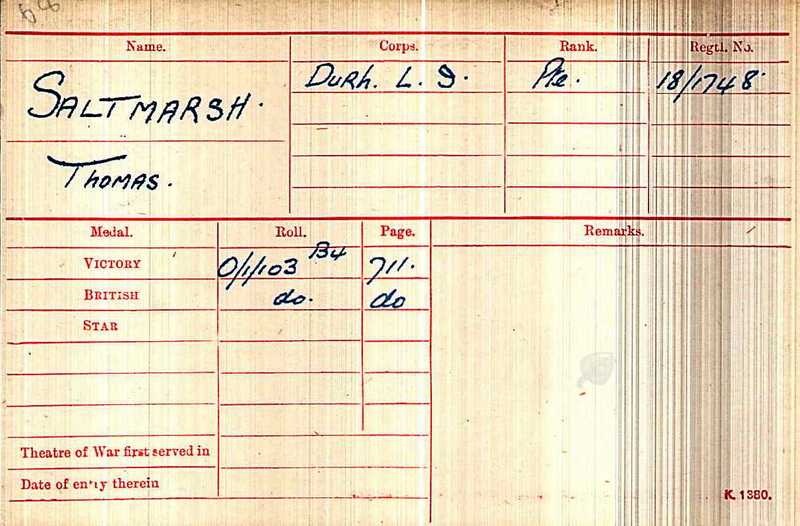 18/1748 Private Thomas Saltmarsh, 15th Battalion, the Durham Light Infantry was killed in action 10 April 1917 and is buried at Cojeul British Cemetery, St. Martin-sur-Cojeul, France. He was about 23 years old and is commemorated on the memorial in St. Mary’s Church, Staindrop, County Durham. 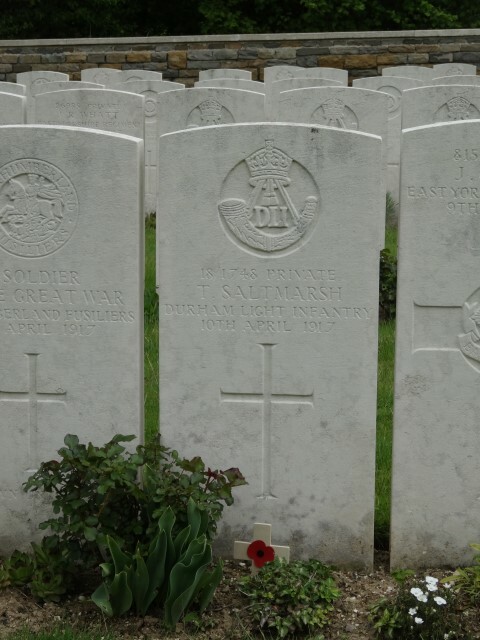 Thomas’ older brother 16916 Company Serjeant Major Frederick Saltmarsh M.M., 13th Battalion, the Durham Light Infantry died of wounds 18 October 1918 and is buried at Doingt Communal Cemetery Extension  and is commemorated on the memorial in St. Mary’s Church, Staindrop, County Durham. In 1901, the family lived at Staindrop (near Staindrop Hall) and 31 year old Frederick worked as a coal miner (hewer). By 1911, the family lived at Church Street, Staindrop. Fred was employed as a coal miner (hewer), 18 year old son Frederick as a coal miner (braker below ground) and 17 year old Thomas worked as a coal miner (driver below ground). Thomas’ father Fred hailed from Latchingdon, Essex. The family lived in the Purleigh Parish in the Ecclesiastical Parish of Rochester and worked as agricultural labourers. Thomas moved north to County Durham with his parents, Samuel and Elizabeth and his brothers Walter, Joseph and Samuel about 1883/84. At that time there was a large scale migration of families from Essex to work at the brickworks at Butterknowle, County Durham although many men found work in the coal industry as miners or cokemen. A terrace of houses at Butterknowle was in fact called Essex Row. The German retreat to the Hindenburg Line: 14 March-5 April and The Arras Offensive, The First Battle of the Scarpe, 9-14 April. The Battle of Arras opened in the early morning, 9 April 1917. The major British assault of the first day was directly east of Arras, with the 12th Division attacking Observation Ridge, north of the Arras—Cambrai road. After reaching this objective, they were to push on towards Feuchy, as well as the second and third lines of German trenches. At the same time, elements of the 3rd Division began an assault south of the road, with the taking of Devil’s Wood, Tilloy-lès-Mofflaines and the Bois des Boeufs as their initial objectives. The ultimate objective of these assaults was the Monchyriegel, a trench running between Wancourt and Feuchy and an important component of the German defences. Most of these objectives, including Feuchy village, had been achieved by the evening of 10 April though the Germans were still in control of large sections of the trenches between Wancourt and Feuchy, particularly in the area of the heavily fortified village of Neuville-Vitasse. The following day, troops from the 56th Division were able to force the Germans out of the village, although the Monchyriegel was not fully in British hands until a few days later. The British were able to consolidate these gains and push forward towards Monchy-le-Preux, although they suffered heavy casualties in fighting near the village. 9 April: The 64th Brigade did not attack until about 4pm. “C” Company on the right. “D” Company on the left led the advance. “B” and “A” Companies followed in support. “C” Company took the first German trench and joined up with the East Yorkshires on the right. “D” Company was held up. Machine gun fire prevented the advance of 9/KOYLI and bombing action led by Second Lieutenant K.H. Saunders took 300 yards of trench but failed to quieten the machine gun. 10 April: at 5.00am another German bombing attack came down the trench from the left. This was only repulsed after a fierce fight lasting an hour and a half. Another counter attack from the left was repulsed. At 7.15pm bombing was heard on the right and the East Yorkshires were seen retiring to the sunken road. The isolated 15/DLI had to give up the trench they had won. The 15/DLI was ordered to retire to the second line of assembly trenches. 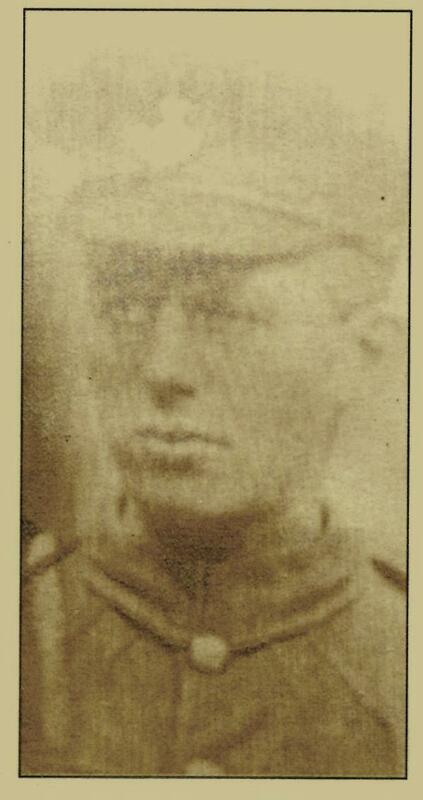 Private T. Saltmarsh served a total of 1 year 246 days. 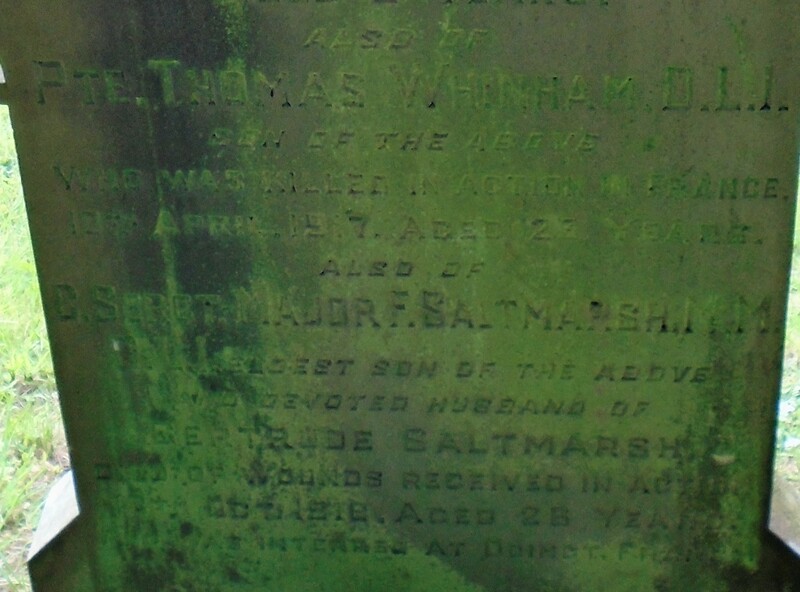 Private Thomas Saltmarsh is commemorated on the memorial in St. Mary’s Church, Staindrop, County Durham.